I purchased this table to match the coffee table that I also purchased. Love the unique design of both. 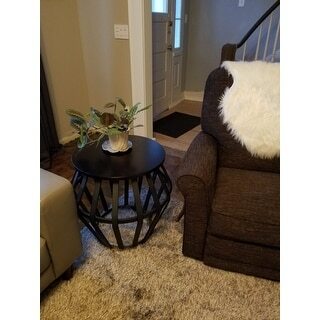 Add a contemporary and urban look to your room with this practical round cage Devon End Table from iNSPIRE Q® Classic. Its rich dark cherry top finish combined with a black base finish makes it look classic, yet modern and impressive. 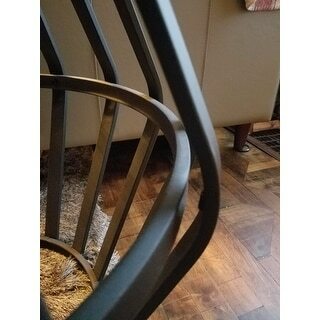 It has sturdy metal veneers that are durable, making this an ideal eclectic piece. Really like this table. My one small complaint is that the bar in the middle doesn'the fit together like it should, but you hardly notice. And like other reviewers mentioned, the top wood piece is darker in person than online. But that'a no big deal since we have all shades of neutrals in the room. This item is not as described. The top is painted press board, not distressed wood. one stabilizer was missing, making the base tilt. It was difficult to assemble, and the base arrived a full week before the top did. I would not recommend this to anyone. We got the coffee table to match. Perfect for our vintage/modern style in our home. Pretty easy to assemble and great quality! Good sturdy construction. Fairly easy to assemble. Finished product looks great and is as pictured. Con = the table top is made of cheap wood and is easy to scratch, hence the 3 stars. TIP: assemble the table top part on a soft surface as to avoid scratching and if possible, get a glass top for the table. It completes the table and makes it look sharp! 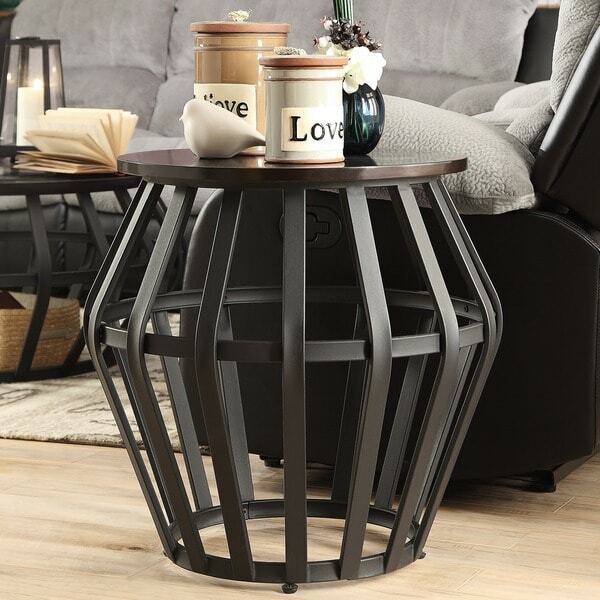 We love the unique design of this end table. It goes perfect with our living room decor. My husband put the table together and it didn't take him long at all, maybe half an hour. Would definitely recommend. 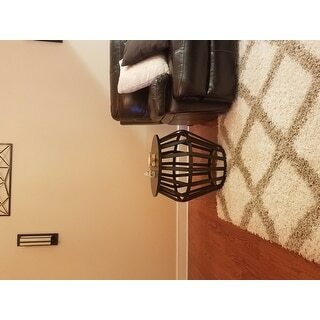 Love the style & color good directions on putting together 1 piece was little hard to get to fit seemed a little bent really can't tell by looking at it only when I was getting pieces to fit together which they did after pushing on it some but overall I love it & would Recommend it's my favorite piece in my living room! 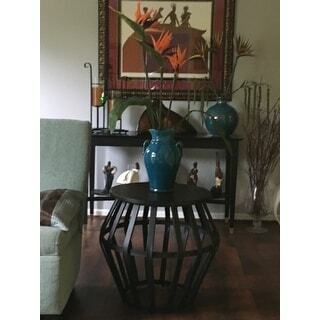 This end table looks great with my new living room theme.Despite what the directions say, you do need 2 people do put this together. I did it myself and end up leaving a screw off because I didn't have anyone to hold the last frame down while I screwed the final screw. You can't tell though! The table is still very tight and sturdy. Embrace the price and style, but not the precision in the engineering. The wood is of a cheap finish and the junctures are just a bit off, but I chose to ignore these flaws and enjoy the fact that they are beautiful. I will eventually replace the tops with real wood or stone, as I don't expect they will hold up well. 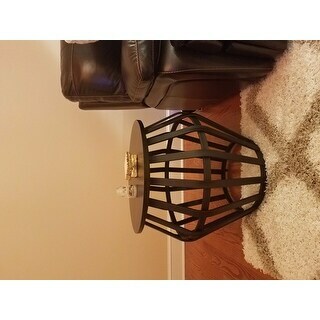 I bought 2 end tables and it looks perfect in my space.. Rustic with a little industrial vibe because of the metal base!!! Very easy to assemble both put together in 20mins!!! I was pleasantly surprised at the size of these tables. They were easy to put together and they add a different element to my living room. The tables are very sturdy. They are really amazing. I may buy the bigger table now. Quick delivery. Easy assembly. Definitely would recommend. Great looking and useful piece. This side table is a good addition to my living room. I like the height - reaches almost to the arm of my couch so it’s convenient for drinks and remote controls. The footprint is a little wider than I expected but I still like the way it fits into my space. This table was perfect for our living room. It went along great with my rustic theme. Easy to assemble. We ordered the coffee table and I absolutely loved it so I also bought two of the end tables. The quality is great and they look great in our living room! Love these! They look great and I get lots of compliments on them. Easy to assemble. Good quality. We bought the coffee table and one table from Walmart.com. They didn't have additional pieces, but as I examined the receipt I noticed it was shipped by o.co, so I came over and ordered it from you. The quality is great and looks great in our living room.